Dave Roberts had the good fortune to inherit some money after his aunt's death in 1999. Instead of using it sensibly, to replace his rotting windows and the hole in the kitchen ceiling, he purchased a sports car in kit form, built it, and took it motor racing. There followed 15 years of fun, learning, and various tribulations. 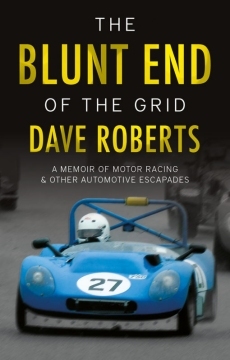 At the end of it, facing retirement from working life and the curtain coming down on motor sport activity, he began to sift through his recollections and some accumulated writings, realising that a coherent memoir might be achievable. As the last season on the track unfolds, none too successfully, he shares his thoughts on coming to terms with the imminent withdrawal from a delightful addiction, and recalls many of the humorous moments along the way. We hear about kit cars and jalopies marooned on various hilltops in East Yorkshire, and even Brighton. We see how he left trailers and even tow vehicles behind on the way to race meetings, how to convince a close rival on track of your possible lunacy and his `epic' season long battle for a third in class trophy. Along the way Dave tells of hints and tips for car building and how this carries over to life in general. And, probably most importantly, how to achieve a standard at salsa dancing, just a smidgen ahead of `complete nincompoop'. About the Author: Dave Roberts lives in North Ferriby, East Yorkshire. He studied for a BSc in Psychology and MSc in Information Technology at the University of Hull. Following this he worked driving taxis, lorries and vans for various employers in Manchester, Brighton and Nottingham. He then worked as a driving instructor until retirement. Dave started circuit racing at the age of 50 and this entertaining, honest, and occasionally poignant book is the result of his accumulated writings. Be one of the first to review the Blunt End of the Grid.